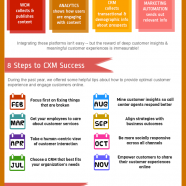 Overview of customer experience management (CXM) workframe as a sum-up of past year’s acquired experience according to CMS Wire. Offering meaningful customer experience requires integration of several platforms with traditional business opertations. Have a look.